With Greg Soutiea (L) and John Cash (R). Pics by Aravaipa Running unless noted. The usual disclaimers apply: I write these reports mostly for myself, to get down in as much detail as I can remember everything relevant that happened, for later reference. Others will hopefully find them useful as well, but there's probably more than you'd want here for a casual read. Well. I managed to win perhaps the most prestigious 24-hour in the U.S. (at least, the men's division! ), so I should be happy, right? Yes and no. Winning was not easy, and I'm proud that I was able to fight hard enough for it. Most importantly, I've preserved my #4 spot on the qualifying list for the U.S. national team for 24-hour world championships. 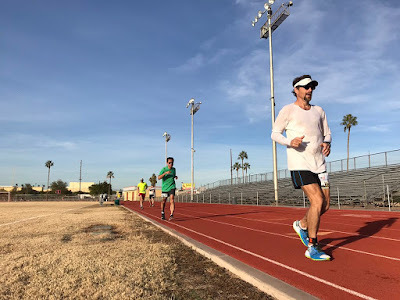 It's not a lock – there are still three months left in the qualifying window – but it's looking a lot safer than it did before Desert Solstice. Three guys would have to run over 149.24 miles to kick me out, and nobody has managed that for all of 2016. Also, I've now run four 24-hour races, won three of them, placed second in the other (Desert Solstice 2015) behind Pete Kostelnick's incredible 163.68, set one course record, and set two American age-group records. That's all great! But. I came into this race feeling like I was in the best shape of my life. Yes, at 51, I am not getting any younger. But I was coming off a Spartathlon performance in September that was two hours better than last year's, and last year's was already pretty damn good, if I may say so. I hit higher training mileage this cycle than ever before. I had more experience under my belt, so I could dial this in to an optimal performance. My weight was good. I felt strong, with no weak links. Anything can happen in a 24-hour, but I was very confident of at least low 150s, possibly high 150s. I ran 144.71, four and a half miles less than last year. But I'm getting ahead of myself. Let me set the stage. Desert Solstice is an invitational track race, in Phoenix, Arizona, in December, with both 24-hour and 100-mile results and awards. It's limited to 30 people; you have to run a pretty decent time or distance to get in. It's become THE place to try to qualify for the national 24-hour team. Many records have been set here. 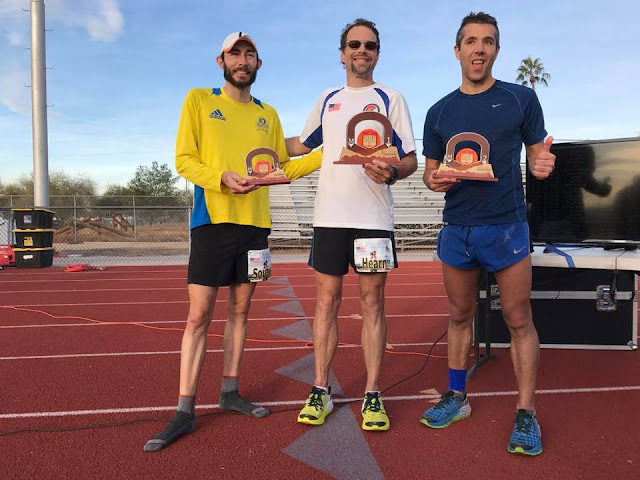 Aravaipa Running puts on a top-notch event, optimized to give the runners their best possible opportunity to put up big numbers. This year's line-up looked especially intimidating to me. There were at least half a dozen guys who could plausibly run over 150. It was my job to make sure that if they did, I ran more. It was also a reunion, of sorts: several runners I ran with at Dawn 2 Dusk 2 Dawn (D3) in May, and/or Desert Solstice 2015, were here. It was a great pleasure to see them all again (as well as D3 race director Bill Schultz). It was also a great pleasure and luxury to have dual crew support this year, from both my wife, Liz, and my good friend Scott Holdaway (who also crewed me last year). They'd be able to spell each other. Pre-race, things went smoothly. We got into Phoenix on Thursday, to have a solid Friday to relax before the race on Saturday. I got in an easy shake-out run. So did Liz, and she happened to meet Bill Schultz at the track. I'd been looking forward to introducing them. Leave it to Bill to beat me to it! He finds a way to get to know everyone. Friday evening we had the traditional meet-and-greet dinner at a pizza and pasta place, and picked up our bibs. I got to meet several of the unfamiliar faces, whose qualifications I well knew from stalking their UltraSignup profiles. But it turned out that a few of the big guns (Zach Bitter, Anders Tysk, and Olaf Wasternack) had pulled out at the last minute, and would not be joining us. Huh. Joe Fejes had handicapped the race, placing me in 4th, behind John Cash (Joe's prohibitive favorite), Anders, and Olaf. So now I had "moved up" to 2nd before the race, I guess. Others I was worried about included Josh Finger, Greg Soutiea, and David Huss. Josh I had run with at Desert Solstice last year, and at D3. He's way faster than me, and it seemed like just a matter of time before he put together a solid 24. I got to know David a bit at dinner. Joe himself had the course record here of 156+, until Pete shattered it last year. Joe insisted he was not at racing weight to make a good showing this year, but I was not counting him out either. (We had quite a duel last year.) I also knew several of the women, but didn't meet race favorites Gina Slaby and Courtney Dauwalter until during the race. It was a pleasure to finally meet Tracey Outlaw, 24-hour enthusiast extraordinaire, and manager of the U.S. National 24-Hour Team Facebook group. Before I get to the race itself, let me digress some more. The story of a 24-hour race is told, in broad strokes, by its lap-split chart. A perfect chart would be a horizontal line, totally even splits. Most actual 24-hours, even when races are won and records are set, have pretty substantial positive splits, with significant slowing. This is the chart from my first 24-hour, New Year's One Day 2014. Here the laps are 1.065 miles. The pink band is where most of the splits should be to run a really good 24-hour, good enough to make the U.S. team. As this was my first, I didn't have high hopes there, but gave it a shot. You can see I gave up on this after about 8 hours. I then held steady for quite a while, but backed off a couple more times late. Still a solid run, 139.5 miles, course record by 12 miles, and good enough to get me into Desert Solstice. The only other noteworthy feature here is the slightly spiky alternation. That's because I had no crew, and stopped briefly every other lap to drink some Coke. A pretty simple story. Next chart, Desert Solstice 2015, run on a 400m track. The spikes are due to my planned periodic walk breaks. This chart would be great, apart from that big problem about 10 hours in. Stuff happens in these kinds of races. Sometimes you recover. Here, I ran solidly for the rest of the race, at a slower pace. The dip back to a faster pace 18 hours in is where Joe Fejes challenged me, and I responded. As he faded, I eased back to my steady post-crash pace. Still a pretty comprehensible chart, right? The story of the race is right there; it's pretty clear. WTF is that???!! If this is a story, it looks like a tale told by an idiot. What happened, and what does it all mean? Well, I am still trying to figure it out. But now let's get to the race, using this chart as a reference. Early on, it was apparent that this year's race was going to be very different from last year's. In most 24-hour races, most people start far too fast. Last year, a group of six or so men were on pace for 170+ after a few hours. Of course they didn't plan to hold that pace (I presume! ), but still, it was way too fast. Indeed, they all fell apart except for Pete (ran 163+). There's a psychological dynamic here that it's hard to avoid. You see all these other guys who know what they are doing (or they wouldn't be here) running like they want to hit 160+. You think, oh my God, it's going to take 160 to make the team this year; I'd better keep with them! But that's a really bad idea. I am able to resist that pull and run my own race. That race dynamic works to my advantage. This year, I thought the roster looked even more intimidating; thus, I was expecting another race out of the gates. But that didn't happen. Whether it was because the last-minute drops left us short of critical mass, or because everyone was simply running smarter this year, I'm not sure. Anyway, there went one source of competitive advantage! 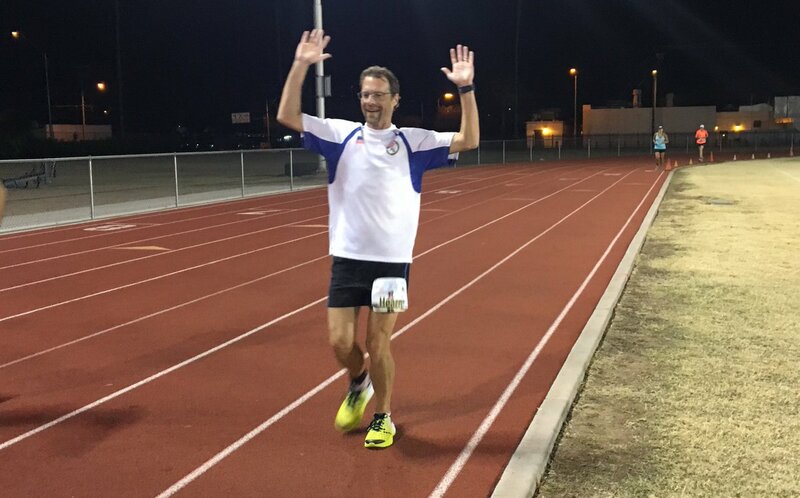 Indeed, the only people running fast (lapping us all frequently) were Kristina Pham (going for several short-distance records), Jay Aldous (going for an age-group 100-mile record), and Gina Slaby (whom we will come back to!). I had my eyes especially on John Cash and Josh Finger. They were both running slightly faster than I was, but well within the bounds of what I'd see as smart racing. John, I knew well, is a smart pacer. How he did was probably going to be a function of how his stomach held up, assuming he came in in good shape with no injuries. Josh has tended to go out too fast, but he's aware of this and working to fix it. The first several hours passed without incident, as we all became more familiar with each other's faces (or backs at least), paces, and running styles. I had a few more bathroom breaks (extra spikes in the chart) than I'd have liked, but that settled down. The main thing now was to deal with the impending heat of the day. Last year, the high had been 66, which was already enough to contribute to my early crash. This year it would hit 72. So I got ahead of that early and aggressively, by switching to an absorbent cotton t-shirt and reflective armbands, and keeping them soaked with ice-water sponges that the volunteers were ready to provide. Plus I had done sauna training for the past few weeks. Josh meanwhile donned an actual ice vest, something with some kind of cooling material that you pre-chilled in ice. Also I upped my water consumption. I never felt hot, but it can sneak up on you, so I took the cooling job seriously. Though I never felt hot, I was beginning to get tired by about 7 hours in. We seemed to have already hit peak temperature, as the sky was becoming overcast. So I figured it was time for the planned slowdown, from 2:13 laps to 2:23s. I'd been thinking 24 laps (three 8-lap sets). But I didn't feel especially reinvigorated after that, so I ran one more set before speeding up again. Total cost 320 seconds. It would be well worth it if it averted my characteristic big crash. But alas, it seems to have just deferred the crash. 2:13s got harder; I decided I'd back off to 2:20s for a while and hope to get some energy back. But those got harder as well. Eventually I was in another full-on crash, walking several laps. I guess, now, this was a low-glycogen bonk, not just an effect of pushing a bit too hard in the heat. It seems I have a rough transition from carb burning to fat burning, even though I'm very adapted to fat burning. After walking 7 laps I was able to start running again, but now was unable to hold even 2:30s; each laps was progressively slower. This went on a while longer until I gave up and walked some more (second crash, 13 hours in). Surely, that would be enough to get a solid reset, as had happened in my other races? Another strange thing going on here was that I developed a ridiculous backward lean. Everyone noticed it; even my crew Scott, who is not a runner, asked me what was going on. Of course, it's hard to run efficiently if you're leaning backwards. But I didn't seem to be able to do anything about it. I did feel a bit dizzy at the run/walk transitions, again suggestive of a bonk. And maybe the dizziness contributed to lack of postural control? I don't know. By this point my race goals were beginning to look not so reachable. But on the men's side, at least, nobody else seemed to be having a great day either. This is about when Josh dropped. I saw him sitting in a chair: "Taking a break?" "Yeah, for about 11 hours." I'd pulled to as much as 11 laps ahead of John, as he'd suffered through stomach issues. Now, after two extended walk breaks, that lead was down to one lap. Padraig Mullins was well ahead of all of us. But (1) he's Irish, so couldn't kick me out of a U.S. team slot, and (2) his 24-hour PR was 133. He was shooting for 140ish. So I expected him to slow later. And Jay Aldous was still leading the men, but he was going to stop at 100. For the first time, I switched to a fresh pair shoes during a race. (That's the big spike at 14 hours, an 8-minute lap.) It wasn't easy. I tried to sit down and bend over to do it, but cramped up. I had to have Scott change them for me while I was standing. My feet felt better after this, but again I couldn't hold even a 2:30 lap. This kind of collapse was unprecedented for me, and very puzzling. During this third extended walk break, I began to get apathetic. I chatted with Joe here (also not having a great day) while walking, discussed just walking it in to get a 100-mile time and stopping. On the women's side, things were different. Gina was still moving like a machine, lapping everyone else like clockwork. What was she trying to do? 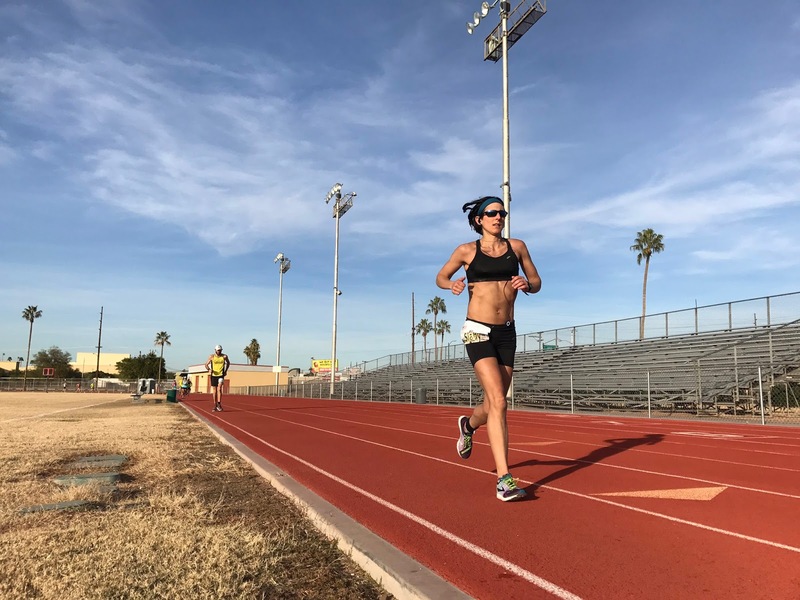 It wasn't until she was close to 100 that I heard she was going for the 100-mile world record. Wow! And apparently she went in shooting to make the 24-hour team, but switched goals when her pace was so easy. She made it by two minutes, running 13:45. I had a ringside seat to see history being made. Ann Trason's record had stood since 1991. Besides Gina, Courtney Dauwalter was also ahead of all of the men, including Jay. She also looked very strong and steady, and was here for the full 24. If she didn't collapse she'd have a huge number, and a team spot for sure. But by and large, the rest of the women were having a day more like the men were having. Several were trying to defend or post team-qualifying marks, but it just wasn't the day for it. Melanie Rabb managed to turn in a solid 100 miles on a broken foot(! ), but couldn't continue. I was glad I helped talk Dennene Huntley into continuing for the learning experience when her 200km goal slipped out of reach. As I approached my own 100-mile mark, much later than planned, I realized there was something else here to run for – the 100-mile podium. The trophies were on a table we could see from the track, and looked pretty nice. Jay had the win locked up (he managed to set the U.S. record for 55-59, missing the WR). Greg Soutiea had passed me a while back. And Padraig was also still ahead of me. Could I beat Greg or Padraig to 100? By the time I looked at the lap counts, there was too much ground to make up. Not only that, just then John passed me as well, so I'd be 5th to 100. Ah well. With that I lost a little more oomph and slowed again (16:30 on the chart). After hitting 100, I again walked a few laps while I sorted out what, if anything, I wanted to accomplish during the rest of the race. I had a nice long conversation with Melanie. She'd been in the 6th and final team slot, but Courtney looked pretty solid to knock her out. Padraig stopped at 100. That left me in 3rd for the men's 24 behind Greg and John. Did I want to suffer for another 7+ hours for a third-place trophy? 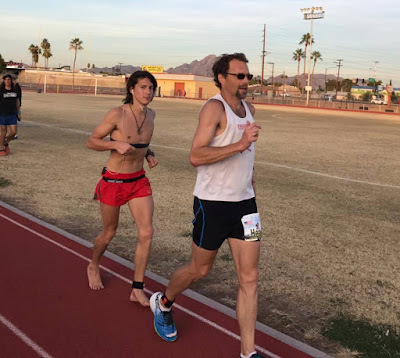 And Andrew Snope (running barefoot, and bettering his own Guinness World Record for barefoot 24-hour) was not too far behind me, so I would have to work. But there was still a chance I could get my mojo back, and no guarantee whatsoever that John and Greg would stay strong. Indeed, John must have puked 20 times already. Then he would walk trying to get some food down, then he'd be back to running strong laps with perfect form. Again and again. it was surreal. Earlier in the day, more than once, I'd counted him out. But he doesn't give up. And now is when it gets weird (17 hours on the chart). When I finally started jogging again, not too optimistic or enthusiastic about the rest of the race, the magic and mystery started. Now, finally, 2:30 laps were easy, and I found each lap split faster than the last. Now, one other change here was that I went to walk breaks every 7 laps, instead of 8; perhaps that helped? But I think it was mostly that my body had finally recovered enough, and had fully transitioned to fat burning. My eyes widened as I saw 2:20, 2:15... 2:07?? And I wasn't pushing the pace. Finally a 1:59. This was beginning to become alarming. There was no reason to run this fast, and certainly it would not be sustainable for the rest of the race. But that was the only speed I seemed to be able to run. I caught up to Greg and John, and passed them. I was repeatedly lapping them quickly now, not by choice. As good competitors, they were both encouraging and complimentary. You have to admire triumph of the human spirit over adversity and exhaustion wherever you see it. Still, I'm sure it must have been disheartening for them. For me, it was confusing. I COULD NOT slow down. Instead, I gradually lengthened the walk breaks. When Liz relieved Scott on crew duty around 4:30 am, I pressed her for advice on my predicament. She told me I had to find a way to slow down. I lengthened a walk break to a whole lap. After that, I was able to run a few 2:10s or so, better. But I couldn't really sustain it. Without intense focus it would shift back to 2:04 or faster. It really was magical. I would be walking painfully (but, by the pace chart, much more quickly than my earlier walking spells), then when it was time to run, a switch flipped, and it was smooth and effortless; I was in a zone. I always do best in the deep of the night, when it's coolest. It was effortless, but still hurt like hell. I could easily tell my body to run, and it would, fast, but painfully. 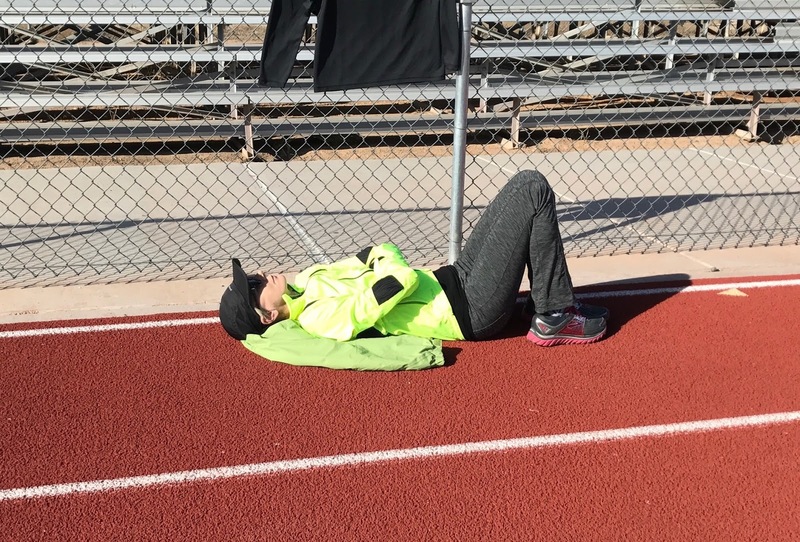 The whole-body fatigue you get after running for 20+ hours is just something you have to accept and deal with in these kinds of races. But with my distance goals gone, I didn't want to have to deal with it any more than necessary to hold on for the men's win. I wasn't paying attention to where Courtney was, but she was still well ahead of all the men. She did have a rough last few hours, when I was lapping her quickly as well, but not enough to catch her. Had I tried, perhaps I could have kept the effort level up enough, perhaps not. Once again I was destined to win the men's race, with a woman winning overall. I just didn't care at all. (In the end she ran an outstanding 147.49, the 5th-best ever by an American woman.) Anyway, once Liz told me I was 10 laps up on John, and 12 on Greg, I started walking more and more. That was my only means of pace control. I went to walking a whole lap every 6 laps, then eventually every 5. I started walking the first 100 meters of every lap. So that's all the mess towards the end of the pace chart. It looks confusing, but is pretty much explained by my motivational and tactical state. I had hoped that after I'd established a large enough lead, John and Greg might call it a day, with at least John's distance goals also unreachable. It takes an enormous amount of mental strength to keep running when there is nothing worthwhile to accomplish, and every single lap is a fresh opportunity to take advantage of a welcoming chair. Whether they might otherwise have stopped or not, though, they were locked in a tight battle for second, and neither would yield. So, I couldn't let up either. Indeed, John was now running sub-2 laps as well, when he wasn't puking or walking. Greg, amazingly, seemed to have kept a steady pace and a positive, energetic attitude for the entire race. That's how you do it, in an ideal world. I'm told that the last several hours made for very entertaining race viewing, as John, Greg, and I gutted it out. Not only can the spectators see the battle unfold, but from the inside, we competitors can all see exactly how we are all doing, as the lap differences move up and down. Only on a long track race can you get something like this. But from my perspective, at least, it was a special kind of hell. Which of us can hold our hand in the fire the longest? With about an hour and a half left, my lead was down to 7 laps, and it became clear to me that at this rate John would catch me. I had just about resigned myself to that. You get stuck in a mindset that what you are doing is the best you can possibly do. I didn't want to accept that I might be able to, and have to, work harder to hold onto the lead. But Liz told me to just keep running. And with an hour left, I realized that if I ran at all, he wouldn't be able to lap me quickly enough. I cut out the whole-lap walks, and that was enough. As the sun rose, it began to sink in that I had done it. The day had not gone at all according to plan, but I had persevered and would come away with the win. Finally, with 10 minutes to go, and my lead at 5 laps, I allowed myself to walk the rest of the way. If I stood still, John would have to run five sub-2s to catch me. Wasn't going to happen. So that's that! I survived. 24 hours will eventually get there, though it seems like it won't. But though the race was over, my body was not done throwing me some curveballs. After the awards, Aravaipa wanted to do a video interview with me. But I could barely talk. My tongue felt like it was made of cotton; I had a huge lisp. 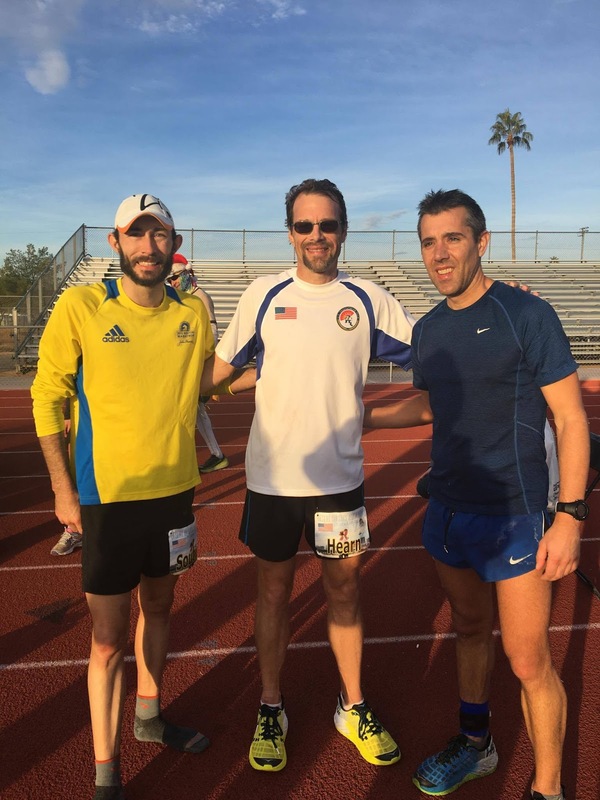 The really odd thing is, Scott reminded me that the exact same thing happened after Desert Solstice last year. Some weird depletion thing, I guess; of what, I don't know. So, now what? I think it's pretty likely now that my 149 will hold up to make the team. The next best chance for people to put up big numbers is probably Jon Olsen's race in late February, Riverbank One Day. If I get bumped down there, there are a few options in March for me to take another shot. Of course I'd have to be trained, and I'd rather not peak until June. But I am signed up for Umstead 100 on April 1, planned as a training run for 24-hour worlds, so it's not like I'd be completely detrained for March. In the meantime, I have to sort out all the weird things that happened to me this race. The two thoughts that seem most likely are (1) doing a one-day carb load before a race like this is a really bad idea, making my transition back to fat burning during the race really rough, and (2) maybe 100 calories / hour is really not enough after all. I'm working with a sports nutritionist, and we're putting together a plan to test various ideas here. 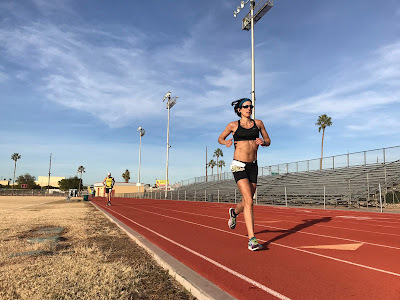 From that perspective, I would like to have another try before worlds anyway, but really, training for and racing a goal 24-hour are both very draining things to do, not just for me but for others around me. So I think probably I will base my decision on whatever happens at Riverbank. 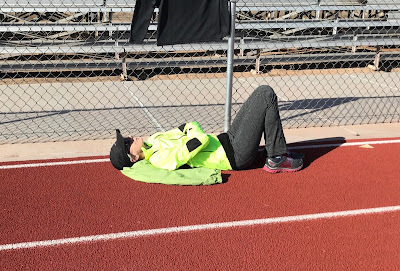 A hearty THANK YOU again to Liz, Scott, Aravaipa Running, Bill Schultz, Tracey Outlaw, and everyone else who was out there supporting us all. It was much appreciated!